Special Containment Procedures: SCP-1776 is to be kept behind opaque shatterproof glass in a locked room at Site 632, the offices of Foundation front company Springfield Cargo Protection. Task Force Omicron-6991-B ("Whackblotter") is responsible for the security of Site 632 and SCP-1776. TF 6991-B is to be employed indirectly by Site 632 management and is not to be made aware of the Foundation's existence. Members of TF 6991-B are to be recruited exclusively from police and private security backgrounds. No person who has served in the armed forces of any nation or in any paramilitary organization, including as part of a Foundation task force, is to be involved with the testing or containment of SCP-1776. An unused flagpole is to be installed in the secure plaza at the front entrance of Site 632. In the event of a containment breach, affected individual/s should attempt to seek out this area on their own. Plaza is to be evacuated and all ex-military personnel cleared from the area until SCP-1776 is returned to containment. In the event of a mass containment breach, aerial dispersal of Class-E amnestics is authorized. Additional security forces may be deployed as necessary providing that only non-military personnel are deployed. This effect continues for as long as the affected individual is within visual range of SCP-1776; removing SCP-1776 from the subject's vicinity, or vice versa, is sufficient to negate its effect. If multiple individuals of similar military backgrounds are exposed to SCP-1776 at once they may attempt to cooperate in capturing and displaying it; however, such partnerships are fragile and have been observed to break down quickly, especially if the individuals involved are of different regimental histories. SCP-1776 was acquired by embedded Foundation resources within the United Nations peacekeeping mission in Yugoslavia in 1992. Three days of intense rioting in Sarajevo was found to be focused around an office building in the city's economic center. Reconnaissance identified SCP-1776, which was being displayed from a third-story window, as being the focal point of intense factional warfare which the greater riot was centered around. The Foundation's first attempt to disperse the rioters and acquire SCP-1776 failed when Mobile Task Force Omicron-6991-A ("Don't Have a Chao") broke contact after informing Control that they "[weren't] letting you bastards burn our flag". 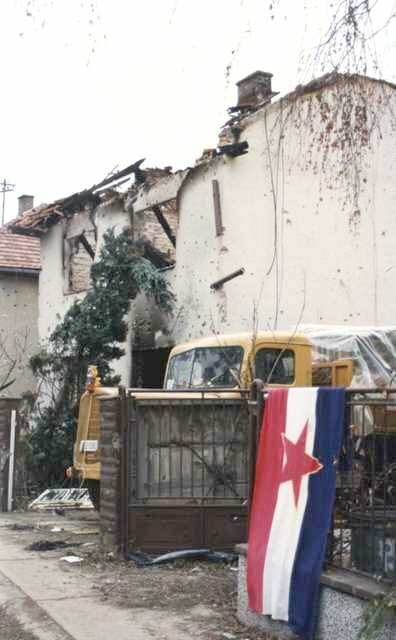 The office building MTF 6991-A had taken control of was destroyed by aerial bombardment, resulting in the deaths of the MTF, and a civilian team was deployed to remove it from the rubble.